Because one dragged out birth secret wasn’t enough, we have to have another one that I find greatly disappointing and unnecessary. Seriously. But, on the upside of things, only one more week and this baby is over. Now let’s jump on this even more logic-defying sinking ship. We open with Chang Hee and Jang arriving and the prosecutor’s office where they are met by Hae Joo and San. 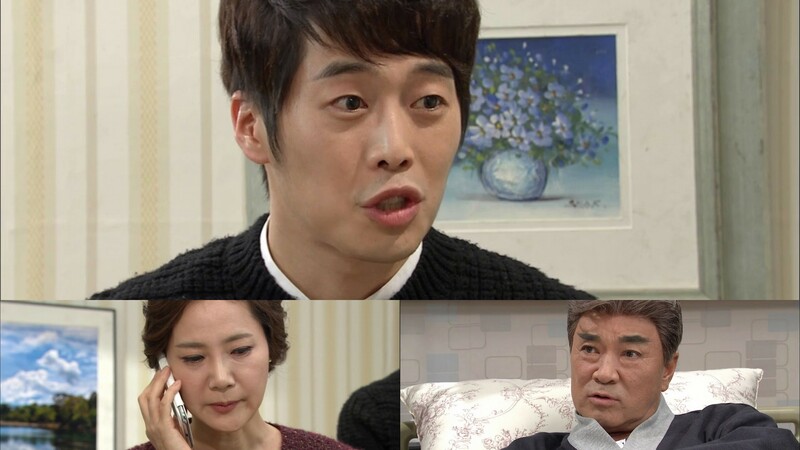 Jang asks them if they still believe that he killed their parents. San replies with Jang’s greatest crime is knowing that he has done wrong, but refuses to admit it and show remorse, etc. Jang then says they will see who wins in the end. Hae Joo then reveals she was the one who installed the security camera. Jang comments on Hae Joo’s change. Hae Joo yells that it is all his fault. What’s wrong with her using his own methods? Hae Joo swears that she will never forgive him and make him pay for all the crimes he committed. She grabs him crying and screaming and this really seems to take Jang and Chang Hee aback. San gets her to stop and Jang goes to head inside. Hae Joo turns and screams after them that Park Chang Hee is the same as Jang and she will never forgive him either. This hurts him and makes him pause, but he says nothing and continues inside. San then gets the upset Hae Joo to leave. This is a character who is one step away from a nervous breakdown. Inside, Jung Woo says that since Jang came voluntarily, why doesn’t he explain things. Jung only coughs and this makes Jung Woo laugh. Chang Hee responds by saying that it’s illegal and impermissible to use the video recording in court since it was done without Kim’s knowledge or agreement. Jung Woo throws back Chang Hee’s own wrongdoings of recording and doctoring the audio conversation. Touché. Chang Hee says it never happened, but we all know it did. Jung Woo then tells Jang to stop hiding behind Chang Hee and answer for himself. Jang then says he only hit Kim because he believed Jung Woo’s lies and only gave him money because he felt badly for his situation. Isn’t that okay? Jung Woo then asks if Jang thinks the National Intelligence Service would believe such lies. This shocks Jang. Say what? The Central Intelligence Agency that Jang embezzled funds from is under the direction of the NIA. Does Jang think the NIA will stand still now? Jung Woo then changes tact. Why did Jang kill his hyung? Jang swears he never did and Jung Woo reminds him that Gi Cheol has already confessed that Jang murdered Hak Soo. Chang Hee quickly jumps to his father’s defense and says Gi Cheol only confessed because Jung Woo threatened him. Right. Chang Hee then warns Jung Woo to not threaten his client again. Jung Woo asks why Chang Hee became like this. Did he want to be president of Cheonji so much that he easily threw away his manhood. Wow. Major insult. Chang Hee only answers that he won’t answer personal questions. Jung Woo lets it go and says it’s time to start with the current list of charges starting with buying a witness’s testimony. Jung Woo vows that no matter how long it takes and even if he loses his job, he’ll fully expose Jang’s sins this time. At the Yoon household, the Chun family is trying to understand what exactly happened. Sang Tae is amazed to learn that Jang is a murderer and Young Joo is creeped out to think about how much she liked Il Moon. San tells them that even if a court of law can’t convict Jang of his crimes, he will face retribution one day. The out of it Hae Joo excuses herself to go to work (the girl hasn’t been looking good for awhile now). Dal Soon says that Hae Joo should be resting at home on a day like today, but we all know Hae Joo works when she’s upset. She leaves and San quickly goes after her. Dal Soon then says she feels badly for thinking ill of Geum Hee when it turns out she spent almost 30 years with the man who killed her first husband. Dal Soon’s life as a widow is much better. San stops Hae Joo. Is she really okay? Hae Joo then says she couldn’t tell them why Hong Chul died. If only he hadn’t taken her in and raise her. She feels so guilty. Aigoo. I’m so sick of her guilt and inferiority complexes. Sigh. San also tells her that none of this is her fault. He tells her to forget such nonsense. Hae Joo says she will and then swears San to secrecy so that the Chun family never finds out the real reason behind Hong Chul’s death. San agrees and then tells her it’s time for them to forget the past and move forward with their lives. If they can’t do that, then they are the losers in the long run. In Hwa rushes home looking for Geum Hee. Is what she saw on TV true? Geum Hee says nothing and Il Moon says it is obviously a lie. But it’s all over the internet right now! Il Moon’s response? Smoke can come without a fire. Well…that is true, but not so in this case. In Hwa again turns back to Geum Hee. She knows the truth doesn’t she? Jang didn’t really do it, did he? Geum Hee actually takes In Hwa’s hand and lies through her teeth. Of course it can’t be true. They must stand by Jang and trust him. Enter one of the butlers who say that Gi Cheol has been taken to the prosecutor’s office. Jung Woo demands to know why Gi Cheol changed his mind and lied after already agreeing to testify against Jang for his revenge. Gi Cheol insists he never said it to begin with. Gi Cheol changing his story doesn’t have anything to do with Chang Hee does it? Gi Cheol doesn’t reply and just said he lied to Jung Woo earlier. Jung Woo then reminds Gi Cheol how good Hak Soo was to him. Gi Cheol insists he’s telling the truth now, but Jung Woo tells him to cut the crap. He knows more than anyone else how guilt ridden Gi Cheol is. Why can’t the man be honest with himself and finally admit the truth at long last? Is Gi Cheol going to finish his life out as a slave and Jang’s dog? Gi Cheol scrunches up his face (looks like he’s trying not to cry or break out and confess the truth) when Yi Soo enters saying they caught Kim at the airport trying to escape and have brought him back. Jung Woo shoots Gi Cheol one last glare and leaves with Yi Soo. Jung Woo goes back in to visit Jang and says he’s giving him one last chance to speak things out. Jang says he has nothing to say and Chang Hee says this isn’t right since Jang’s health is not good. Enter Kim. Jang is immediately livid. Jung Woo then orders Kim Jong Bo to quickly tell them the whole truth in front of Jang. Jong Bo then says that Jang assaulted and bribed him. Jang lunges at Kim and is held back by Yi Soo and Chang Hee. Jang then has a bad spell where he gets dizzy and collapses. Jung Woo can only smile. The news soon comes out that Kim Jong Bo has testified against Jang and that the NIA are currently starting their own investigation into the matter. Geum Hee watches this with a straight face while Il Moon studies her expressions. However, thanks to Jang’s sudden bad turn of health, he’s been taken to the hospital and thus the investigation will go into other areas. Hae Joo is upset to hear that Gi Cheol is still denying that Jang killed Hak Soo. Neither Bong Hee nor Hae Joo can understand just what is going on now. Bong Hee replies that her brother-in-law always seemed the epitome of good health and Hae Joo talks about how tormented Gi Cheol was when he came and confessed. San quietly asserts that this has all been Chang Hee’s doing. San’s phone goes off. It’s a call from a director of a company asking to meet San. This makes San very happy. Finally good news? He hangs up and says Ocean Shipbuilding (a place San worked a long time ago) is interested in working with them. Bong Hee says that Ocean is a rival to Cheonji, so working with them would be great. Ocean promises to provide funding and a research lab. Bong Hee says that heaven is helping them and they will soon crush Cheonji. Jang is resting in the hospital. Yep, his spell was completely faked as he’s perfectly fine. Enter In Hwa, Geum Hee, and Il Moon. Jang immediately feigns illness. Soooo unbelievable. However, seeing Il Moon makes him stop his pretense. Jang asks why he’s there and Geum Hee says that Il Moon came because he was worried. Il Moon asks how his father is doing and Jang angrily starts throwing things. Geum Hee tells him to calm down as his blood pressure will only keep going up and his health will only deteriorate that much faster. Let him have an embolism and die already. Once he’s gone, things can only be naturally righted. I would actually laugh if he did die suddenly leaving Chang Hee without satisfactory revenge. In Hwa asks if he’s really that sick. Jang says he has diabetes and his blood sugar and blood pressure just soared. He’ll be fine. Jang then asks if Geum Hee saw the news. Geum Hee says she did and she cannot believe how far he went. Il Moon says her words now bely how she looked when she was watching the news. Like always, Geum Hee paints herself the saint and Il Moon the bad child. Of course, In Hwa jumps to Geum Hee’s defense and Jang gets livid once more. Chang Hee comes in and Jang tells them to go home since it’s probably about Cheonji. In Hwa scolds him for working when he’s ill and Chang Hee says it will only take a few minutes to discuss. Geum Hee tells Jang not only to worry about Cheonji, if his health dissipates further then their family will also be destroyed. The girls leave, but Il Moon stays. He was the president of Cheonji once and holds shares. Jang angrily reaches for something new to throw and Il Moon runs away, tail between legs as usual. Il Moon listens outside the door as Chang Hee reveals San and Hae Joo are partnering with Ocean for the drill. This makes Jang angry. But that’s not the only problem. The NIA are investigating the slush fund and public opinion is at an all time low. Jang isn’t worried about that. It will go away with time. Chang Hee says it won’t just go away. With current opinion and the NIA investigation, they could very well lose the drilling rights—especially if another person develops the drill technology as they can’t win with their stolen thruster alone. Jang tells Chang Hee to stop Ocean and the drill development. Chang Hee says they must steal the design like before. Jang tells him to do whatever it takes to ensure their success. Il Moon has heard all of this. Will Il Moon attempt to steal it himself again to appease Jang? Or will he do his best to destroy both Chang Hee and his father? The head of Ocean meets with Bong Hee, Hae Joo, and San. He’s happy to be able to work with San and the others with their high level of expertise. Ocean is happy to be able to finally have a chance to win over Cheonji. Where do they start? San reveals they have a prototype and just need to begin testing it. This makes Ocean even happier. Bong Hee says they should start today and the quartet get up to go to the lab. Hae Joo excuses herself as she wishes to study more welding methods just in case this prototype fails. San asks if Hae Joo will be afraid without him? Hae Joo says she’s more afraid of him. Bong Hee scolds the two for flirting in front of her. San states that isn’t the case, he’s just worried because of the kidnapping earlier. Bong Hee tsks and tells him to follow her and Hae Joo assures her that she will be fine since Assistant Kim will be there, too. Il Moon meets with lawyer Woo. He asks Woo if its possible to sell off his shares of the company. Woo asserts its impossible. Why? There isn’t a single share in Il Moon’s name. WHAT? Il Moon talks about what he had earlier and learns from Woo that they have already been given over to someone else. Who? Il Moon then rushes home to confront Geum Hee. Was it her doing? She calmly looks up. Was it her who had Jang sign over Il Moon’s shares to Hae Joo? Oh, so he finally found out. Is there a problem? Does Geum Hee think he will stand still and do nothing? He sweeps off the flowers and tea. Geum Hee calls for the housekeeper to act as a witness for Jang and Il Moon states he won’t let her get away with anything before screaming and walking out. Geum Hee smirks briefly. Of course, after that scene Il Moon goes directly to Hae Joo and demands “it” back. What? Is he trying to steal the drill bit this time? Il Moon then says give the shares back to him. Hae Joo says her mother gave them to her, so why does she have to give them back? Il Moon calls her a person with dirty blood and again yells for his shares back. Hae Joo says that he’s so invested in what Jang has he’s doing all of this for a lousy share. Isn’t that the pot calling the kettle black? Hae Joo and San are both following in the paths laid out by their fathers, but she’s belittling Il Moon for doing the same? Hae Joo then tells him she would never give him the shares since he knows nothing about real work and effort. Hae Joo will give them to someone who works quietly and efficiently and works hard to learn a skill. That’s all Il Moon deserves since he grew up under such an evil father. Il Moon goes to hit her and Hae Joo stops him. Is he really going to resort to violence? Enter Assistant Kim. Il Moon leaves after ripping up a paper and warning Hae Joo that its not over. Poor boy. No matter what effort he puts in, he epically fails—even at being evil. LOL. I don’t like that they made Il Moon so dumb and unmotivated, but at the same time, growing up constantly belittled by his father…I guess it’s not surprising. In Hwa is holding a store meeting when Chang Hee comes in. Why is he there? The two go out for a meal. Chang Hee says that he’s sorry for what happened before. In Hwa isn’t buying any of it. Chang Hee says that night only happened after learning about Hae Joo’s real identity and pitying her. In Hwa says that isn’t it. From their wedding night things haven’t been right. She felt that there was an empty shell beside her. Chang Hee gets up and sits directly by her side. Didn’t In Hwa says that she would believe him even if he lied? So why can’t she believe him now? In Hwa says she desperately wishes she could, but she just can’t bring herself to trust and believe him. Chang Hee then pulls out a piece of jewelry. What? Is he trying to buy her affections? Chang Hee smiles and takes her arm. I want that bracelet. I really do. Chang Hee puts the bracelet on her and says it’s to chain her heart. In Hwa again sadly tells him that she hates him and he pulls her into a hug. These two. Il Moon meets with Yang and tells him to quickly steal the drill bit from San and Hae Joo. Oddly enough Yang Do Ri refuses the request and tells Il Moon that he came to Cheonji to become a skilled employee—not a thief. Hmmm…but what about all the shameless backstabbing he’s done for Chang Hee? Is that him becoming a skilled employee? Il Moon tells him stealing information is not like theft. He tells Yang to follow him, but Yang refuses. Is this because he’s working under Chang Hee? Yang loses his cool and growls at Il Moon. If the other man knows, he should just shut up and leave him alone. Wow. Yang Do Ri grew teeth and is now biting the hand that used to feed him. Will this make Il Moon do something stupid by himself? San calls Hae Joo and tells her the drill cracked. They don’t know why it did, but they will quickly figure it out. Bong Hee says it could be a welding issue and San immediately refutes this. There is no way his Hae Joo could make such a mistake. It’s probably a design flaw. Come on. Hae Joo, in spite of being highly skilled, cannot do it perfect 100% of the time, especially since they really aren’t entirely sure of what they are doing. Sheesh. Anywho, Bong Hee and San are on their way with the failed drill to look it over and see what the problem might be. Hae Joo then says that she was thinking something was wrong and she has a better way she thinks. Bong Hee wonders if she should just leave since they are being so lovey dovey. San tries to get her to leave him alone with Hae Joo, but Bong Hee insists she has no plans. Hahaha. Well, I think it’s only fair Bong Hee gets some loverly thwarting in of her own since she’s been thwarted so many times as well. Hae Joo hangs up and continues working on her plans when Il Moon sneaks into the factory. What kind of thief wears the clothes he does? His nice shoes, slacks, sweater vest, etc. Il Moon looks around the office with a flashlight. However, he stumbles over something, making a noise. Whatever it is starts leaking all over. Il Moon doesn’t hesitate and starts looking for the plans. He finds some and a prototype. He takes it out. Is this the one? Unfortunately, he has no idea what the drill is supposed to look like. If only Yang Do Ri was there. His flashlight goes out. He then takes out a lighter. What is with these guys having lighters when they have never been seen smoking? Il Moon then drops it as it gets hot and wouldn’t you know whatever was leaking goes up in flames. Il Moon tries to stamp the fire out, but can’t. In desperation, he takes PAPER and tries to beat it out. Of course, the paper only catches on fire and the fire spreads. Il Moon runs away as Hae Joo comes out. She only catches a figure running away. She wonders who, but that soon escapes her mind as she sees the fire. She rushes to the burning part of the building and starts screaming fire. Call 119 dummy. Il Moon rushes away in his car as Hae Joo, like an idiot. Rushes into the burning building. She beats at the flames with a blanket and then grabs the plans and the drill. She coughs and trips and a burning beam falls and conks her on the head. At this time, San and Bong Hee are returning and almost get in a head on collision with Il Moon. Luckily they both swerve and avoid hitting each other. At this time, Bong Hee sees the flames. Isn’t tha their factory? Bong Hee, like an idiot, only screams fire and the worried San tries to call Hae Joo. Again, WHY aren’t people calling 119? Bong Hee then sees Hae Joo through the smoke and flames. San quickly rushes in. He throws the metal desk and filing cabinets to create a path over the fire and picks Hae Joo up, carrying her to safety. Outside, he tries to wake her up, but she doesn’t. He then tells Bong Hee to hurry and call an ambulance. NOW they call 119. Took them long enough. Jung Woo rushes to the hospital where Dal Soon and Sang Tae are already with San and Bong Hee. What happened? Bong Hee tells him the factory caught on fire and San says they were lucky they got there in time before the worst could happen. Jung Woo asks how much Hae Joo got hurt. San says it was only her hand thankfully. Then why isn’t she waking up? She did earlier, but was in such a state of shock, the doctors gave her a sedative. Dal Soon then says she rushed over as soon as she heard, but she’s still confused and her heart is still pounding. Sang Tae then asks if he will still be able to report to work. San assures him that only the warehouse burned down, so he will still be able to work. San then tells Sang Tae to take Dal Soon home as he will be staying with Hae Joo. Dal Soon doesn’t want to leave her daughter since Hae Joo experienced a horrible shock. Bong Hee assures Dal Soon that she will be there as well, so she should go home and rest. Chang Hee goes to visit Jang. He called? Jang asks Chang Hee to move the safe in the office to the house. Why? The NIA will be investigating and Jang thinks its safer in the house. Chang Hee explains they will search both the house and the office, so its not safe in either place. Jang still thinks the house is safer than the company. Chang Hee asks if the microfilm is in the safe. Jang says it is and tells Chang Hee to hurry and call people to move the safe to the Jang house. Hae Joo wakes up and asks where she is. San tells her the hospital. She bolts upright. Did they catch that person? What person? The man who set fire to the factory? This shocks Jung Woo. It wasn’t an accident? Hae Joo says she saw someone running away right before she noticed the fire. Did she see a face? No, it was too dark—all she saw was somebody’s back. San confirms he thinks it was arson as well. San then reveals meeting the suspicious car. Jung Woo says there is only one person then—Jang Do Hyun. Hae Joo finally notices her injured hand. What happened. San explains she hurt it. Hae Joo orders him to immediately unwrap it since her hand cannot be injured right now. San tells her to calm down. She has fractured bones and injured nerves. It will take two months to fully heal. That’s too late. She again orders him to unwrap her hand. IDIOT. She takes idiocy too far sometimes. Okay. It’s really not idiocy, but rather immense irrationality at this time. With her extensive hand injure, there is no way, even if they unwrap it, that she would be up to the task, not to mention PERMANENT damage. San’s voice raises and he starts scolding her. Jung Woo concurs that Hae Joo needs to calm down and think of her future. Hae Joo says that making that drill now is her only means of getting her revenge. San tells her not to worry, he will see it through. Jung Woo then asks if Hae Joo can’t remember anything since it will be hard to prove arson since the evidence most likely burned. Hae Joo says the person was very tall. She then tells them that Il Moon came to visit her earlier. Hae Joo says he came for the Cheonji shares that Geum Hee gave her. Jung Woo immediately calls and asks for Il Moon to be found and brought to him immediately. At the Jang house, Geum Hee sees the safe that the men brought in. She asks the butler what it is. He tells her it’s the company safe that her husband ordered to be brought to the house. He leaves and Geum Hee immediately locks the door and tries to open it unsuccessfully when she gets a call from Bong Hee telling her about the fire and Hae Joo’s injury. Bong Hee immediately rushes to her daughter’s side. Hae Joo has become slightly more rational and tells her mom not to worry as she’s fine and her hand will only take 2 months to heal. Geum Hee says she can’t relax since something is always happening to her daughter. She then turns to San and scolds him. Didn’t she tell him to take care of her daughter? Jung Woo then says it wasn’t an accident. What does he mean? Jung Woo won’t say anything in the room and asks her to follow him out. The two go to a café and Jung Woo reveals that he believes Il Moon was the culprit. Of course, there is no proof of this, but the younger man came to the factory earlier demanding the shares from Hae Joo. This makes Geum Hee feel awful. It’s all her fault then since she was the one who backed Il Moon into a corner. Jung Woo again tells her to move out. Geum Hee says she can’t since the company safe has been brought to the Jang home. Jung Woo says that something bad can happen to Geum Hee if she continues to stay in that house. Geum Hee is insistent. Jung Woo needs to look after her Yoo Jin while Geum Hee does her best to get the microfilm. Jung Woo then apologizes and says he heard everything from Bong Hee. It turns out he was wrong all of these years. Bong Hee then asks what he means and Jung Woo reveals about what happened over 30 years ago when he returned home during his leave from military duty. We flash back to Jung Woo meeting Jang coming out of his hyung’s house. Jang’s clothes are in a complete mess. The two are surprised to see one another. Jang says it has been a long time and Jung Woo asks if his brother is home. Jang seems very flustered. He’s not sure. He tells jung Woo he’ll see him next time and rushes out. VERY suspicious. Jung Woo then hurries into the house. He sees Geum Hee huddled in a corner crying. After this incident, Geum Hee demanded a divorce from her husband and then after Yoo Jin’s “death,” she married Jang Do Hyun, so he thought there was definitely an illicit relationship. Okay. Pause. You meet a man looking horribly disheveled coming out of your brother’s home and when you go inside you see your sister-in-law huddled in a corner bawling. I wouldn’t have been thinking affair. I would have been thinking something much, much, much worse. And I’m sure we’re going to find out that Jang forced himself on Geum Hee and that’s how Hae Joo was born. That’s also why Jung Woo found it hard to accept Bong Hee’s heart. Seeing how far Geum Hee is willing to go for Hak Soo—even destroying Jang, he knows now that can’t be the case. He admits he’s even started opening his heart up to Bong Hee now. Geum Hee quickly hides her shaking hands under the table. Jung Woo doesn’t see this. Gee, when will this birth secret be revealed? Back at the hospital, Hae Joo asks San if her arm will really take 2 months to heal. Yes. Hae Joo wonders what she can do now since she can’t make the drill bit. San tells her again not to worry that he will take care of everything. Besides, Hae Joo could recover faster than the doctors think since she’s strong like Bigfoot. This earns him a hard slap from Hae Joo’s good hand. Ouch. She scolds him for teasing her and San says she has nothing to worry about with that strength of hers. Hae Joo should take this time to rest up and get completely checked out. Hae Joo doesn’t want to and San tells her that she’s his future wife and the mother of his child, so who will look after her health but him. Hae Joo looks at him and whispers “oppa.” San, realizing what he just said, cancels that and says that it was an awful way to propose. LMAO. Actually, it was kind of cute. It actually reminded me of the Strong Heart episode where Byul talked about how Haha (Ha Dong Hoon) always talked about their future, their house, their kids and never officially proposed. Of course, it’s been awhile since we’ve last seen Hae Joo’s wide eyed shock. San anxiously apologizes and tells her to forget what he said. Hae Joo smiles and San takes her hand. He’s happy that he wasn’t a step too late as if she dies, he can’t live in this world since she is his world. Hae Joo answers him by saying she will live a long and healthy life for him. San smiles and quickly pecks her cheek. He then tells her once more that she never heard him propose, okay? Hae Joo laughs and say she understands. In Hwa is working at her store when a little boy comes up. She’s immediately enamored. Looks like In Hwa really has mommy syndrome. Chang Hee then comes in and In Hwa asks what he’s doing there. Chang Hee says he wanted to see her. In Hwa shows him the 7 year-old. Isn’t he cute? Very cute. In Hwa (very inappropriately since she’s saying this in front of a kid who could probably understand her meaning) then tells Chang Hee she wishes to give birth to a child who looks exactly like him. Chang Hee smiles, but I think that made him uncomfortable. Should they go for coffee? At the café, he hands over rose for their 100-day anniversary. He will never forget any of their special days. He says that he has wronged her and her family. He then asks for the family anniversaries and birthdays. This makes In Hwa happy. I would be happy if I knew he sincerely liked her and wasn’t doing this out of guilt. Geum Hee comes to the hospital where she finds San asleep by Hae Joo’s side. She wakes him up and she asks if he was there all night long. San says yes and Geum Hee thanks her for being by Hae Joo’s side. San then says that he will always protect Hae Joo even in the future. Geum Hee smiles and nods. San then reveals that during a blood test it was found that Hae Joo’s blood sugar is too high. San assures Geum Hee he’ll watch over Hae Joo and asks that Geum Hee also watch over her. Geum Hee doesn’t seem to happy to learn this new symptom of Hae Joo’s. She then gets a call from Jang asking why she isn’t there yet since he misses her. Geum Hee says she will be there shortly and hangs up. She then asks San to take good care of her daughter before leaving. Geum Hee arrives and asks why he’s acting like a child. Jang says he’s lonely and bored in the hospital. Geum Hee scolds him for being such a kid and asks the doctor how he’s doing. The doctor assures her that he’s fine and almost recovered, but his glucose levels remain dangerously high. The doctor then asks when the last time the children were checked. While they don’t necessarily have to inherit their father’s disease, it’s still possible. Of course, the environmental factors affect a person more than the genes. Jang chuckles and says all of his kids don’t resemble him at all so they are fine. Geum Hee’s face is dark. Jang catches this. What’s wrong? She quickly excuses herself to the bathroom. Geum Hee shakes and cries. It’s not possible. It’s just not. We then have her flash back to a scene where Hak Soo refuses to divorce her. Geum Hee cries and says she isn’t qualified to be with him. Hak Soo doesn’t get this. Why is she behaving like this? Hak Soo says he understands she couldn’t forget Jang and that brought him a lot of pain, but this is the path he chose. Geum Hee asserts that isn’t the case—she doesn’t hate Hak Soo. Then what is the problem since Jang is in her past? Geum Hee then yells that it isn’t in the past that person… Hak Soo quickly grabs her before she can finish the sentence and tells her not to say anything. He will take care of her. Later, Yoo Jin is born. Geum Hee sits outside while her daughter cries and the maid takes care of her. Geum Hee goes in to check on the baby and gets scolded for not holding her own child. Poor baby. Hak Soo then shows Geum Hee a paternity test that asserts that Yoo Jin is indeed Hak Soo’s daughter. Hak Soo says that with this, can’t Geum Hee stay with him and he will take care of her and her wounded heart? Geum Hee cries and hugs him. Does Hak Soo know the whole truth? Or did he think Geum Hee had one last tryst with Jang? Oh…and did he fake the paternity results? San Takes Hae Joo out for some fresh air and wraps her in his coat. Hae Joo scolds him saying that he will get cold. San assures her that as long as she’s by his side, then he’ll be fine. He tells her to put her left hand in the coat pocket. Hae Joo does and pulls out a can. What is this? Her future husband bought it for her. How is it? It’s warm right? Hae Joo smiles and says it’s as warm as his heart. San then takes it and puts the can against her face. Geum Hee the comes and sees the happy couple scene. She then goes into Hae Joo’s room where she steals Hae Joo’s hairbrush. We all know what she’s planning, don’t we? Geum Hee goes into Jang’s room where he whines that she’s been gone for too long. Geum Hee says that she’s went to buy him a toothbrush. Why? He’s already got one. Geum Hee says he can’t use just any toothbrush now that he’s older. She goes into his bathroom while he chuckles over her mother henning. If he only knew. How horrible. I really don’t want Hae Joo, Il Moon, and In Hwa all related. I don’t want her to be Jang’s daughter. I really find that horribly unnecessary. Plus, it’s a plot that has been done to death. Bad guy find out kid he’s tormented is actually his flesh and blood. Sigh. Yi Soo goes into Jung Woo’s office to say they have finally caught Il Moon. Jung Woo goes to the interrogation room and slams down a file. Il Moon asks how he can be arrested without a warrant. Jung Woo gets straight to the point. Where was he the other night between 7 and 8. Il Moon immediately looks worried. He lies and says he played poker with his friends. Jung Woo says Il Moon must have made an alibi. He then asks about Il Moon visiting Hae Joo and about the fire. 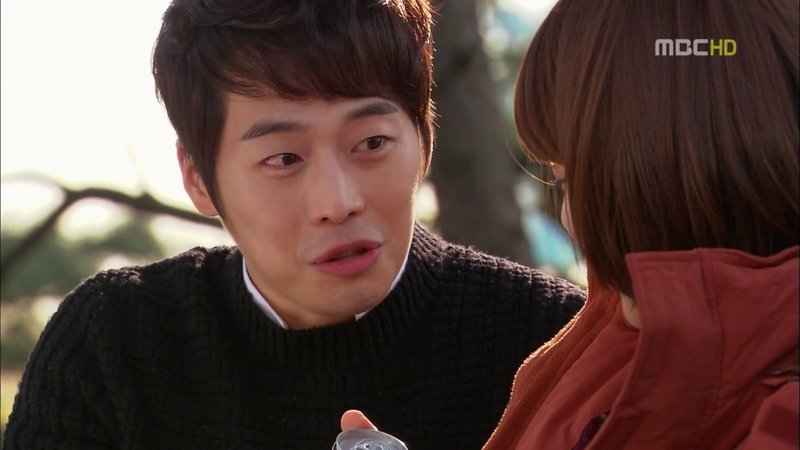 Il Moon immediately says he has no idea what Jung Woo is talking about. Angry uncle jumps up and leaps on top of the table an grabs Il Moon by the collar. How I love you Yoon Jung Woo!!! Lee Hoon is just an awesome actor. He yells that Hae Joo could have died and demands Il Moon to tell the truth. Il Moon insists he had nothing to do with the fire. You can so tell he’s lying. Meanwhile, Chang Hee goes into Jang’s study locking the door behind him. He’s got the list from In Hwa. Sly devil. He’s trying out different combinations using birthdays and anniversaries. Sigh. I KNEW Chang Hee had an ulterior motive. Geum Hee goes to the hospital to visit her daughter and finds Hae Joo gone. She asks the nurse what happened and the nurse says that Hae Joo was discharged by San. Isn’t that too soon? Hae Joo had insisted on being discharged and the doctor said she was well enough to go. The nurse leaves and the doctor comes in with the test results. That fast? It only takes a day. He leaves and Geum Hee shakily reads the report that confirms Jang is really the father of her daughter. She collapses holding her mouth. She then rushes out to the bathroom to vomit as Hae Joo goes back to her room. Wow. Well done vomiting scene. Geum Hee is played by an excellent actress. Hae Joo notices the stuff in her room and immediately tries to call Geum Hee. There is no answer. Where did she go? Hae Joo then notices the papers and looks at the paternity test that confirms she is really Jang Do Hyun’s daughter. More of her wide eyed shock. She then drops the papers like they are diseased and starts shaking. End episode. Seriously. SERIOUSLY? An unnecessary plot move in my mind. And thus…after watching this…there goes my motivations for watching episode 36, 37, and 38. Sigh. Anywho, I will get 36 up tomorrow after work. I have not watched episode 35 yet but this is really an UNNECESSARY plot! I really do not like this development! Poor KS and poor HJ and poor uncle! Thanks for the recap! How hard is it for the writers to insert credible human responses! This episode had me laughing, especially at the fire scene. 119!! 119! And who were Bong Hee and Hae Joo yelling fire to? It was so ridiculous! I hate this second birth secret, It is so over the top. I haven’t been watching dramas for that long – just a year, This along with Nice Guy were my first melodramas so I’m not sure how I should be judging them. Was Nice Guy exceptionally good – I thought it was really well done – or is this drama exceptionally bad? This show is like a bad soap opera. San, Samchun and Bong Hee seem the most normal to me. Hae Joo seems a little clueless and unbelievably naive. And even though, there have been a lot of wronged people – I feel like Chang Hee might end up being the most tragic figure, considering everything he’s given up to exact revenge. I’m glad it will be wrapping up soon. I’m like everyone else – loved the beginning with the child actors, but not the last two-thirds of the drama. Oh, and a peripherally-related note – the Chang Hee/Hae Joo child actors are in Lee Seung Gi’s MV – Return. It’s a beautiful song. Haven’t watched epi 36 yet – no subs…Hoping that the ending revelation doesn’t ruin all the budding relationships. I know, I know…it will all work out in finale week… Thanks for everything, NeeNee! Well…since humans are by nature irrational creatures, I am sure there are people who will panic and NOT immediately think “let’s call 911 or 119” – but still…these characters in EVERY emergency do the LEAST helpful thing. I still can’t believe Il Moon tried to put out a fire with PAPER of all things. Hae Joo was smarter when she tried to use a blanket, but at that point, the fire was beyond smothering with a blanket. I agree about the 2nd birth secret. It’s evil. Now as for melodramas…some are better than others. Nice Guy (I still have to finish it, but I’ve loved what I’ve watched so far) is done well. The acting isn’t too over the top and the characters are more relatable/believable, although I must say Eun Gi’s attitude at the beginning floored me. What a vicious young girl (with a lost little girl inside). Like Gloria, while the 60 episodes did get repetitive, I still believe the show was well done and I didn’t dread watching the next episode like in this series. I might put 36 off until tomorrow. So tired now and not sure I’ll have the ambition to even recap it if I watch it at the moment. Only one more week though. One more week. Thank god for that. Saw your FB post – Relax and enjoy the start of your winter vacation! Halfway through Ep 36. Wow – Yang Mi-Kyeong who portrays Geum Hee does a spectacular job. Her tears are heartbreaking. Aww, thanks. I agree, Yang Mi Kyeong is awesome. I cannot believe how wonderful she is at acting such a broad range of emotions in only one episode. She sends shivers down my spine when she’s in evil revenge mode and she makes my heart break with her heart-wrenching tears. Kudos to her. For such supposedly smart, intelligent people, their reactions at the fire scene were so STUPID! In Kdramaland don’t they ever use their cellphones in an emergency? I was wondering how the actors can act with a straight face with such an inane script. I had such high hopes for this story with the child actors, but now can’t wait for this drama to end. The 2nd birth secret seems so illogical to me. Isn’t Jung Woo supposed to be Hae Joo’s uncle (confirmed by DNA results)? That means Hak Soo is Hae Joo’s daughter! It’s quite confusing how the DNA can subsequently point out Jang as Hae Joo’s birth father. I can’t remember if they played it off as Hak Soo faked the results for his wife’s sake. They, as far as I know, never compared Hae Joo’s DNA to her uncle’s. I was kind of expecting this after awhile, but was not really happy with making her that man’s daughter as it was getting downright absurd.